Google's attempt at toppling Apple isn't a handset or a computer (yet); instead it's having a go through a handset OS. Though if you haven't heard of it yet, where on earth have you been? 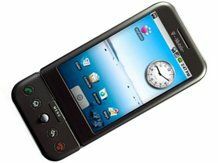 The T-Mobile G1 with Google is going to be the world's first handset running Android, and what's more, it comes with Google Marketplace built right in - the search behemoth's attempt at beating the App Store. Free and paid for applications are there, and what's more the development will be in charge of moderating itself - no Apple meddling and approving each app here. Shop Savvy - One of the applications promoted by T-Mobile for the release of the phone, this application lets users scan the barcode on products using the phone's 3MP camera. This information is then sent to the big price comparison database in the cloud, and the user gets nearby price information, letting them decide whether the product is really worth the money. BreadCrumbz - Designed to show off the open and socially interactive nature of the phone, this application allows users to create a step-by-step visual map using photos they take on the handset. Personal routes can then be shared with friends or even the greater Android community for Android kudos (they're not real, we just made them up). Maverick - When the sheer volume of IM apps out there makes you feel like you're a fly gurgling down the plughole of the net, this app aggregates them all in one easy spot, so you can bring your Gmail friends alongside you MSN buddies. It will also let you know when there's Gmail a-popping in your inbox, so that's a little bit handy too. Softrace - Taking its cue from the likes of Apple and Samsung, this app will let you use GPS to map out virtual races, then allows you to upload them to challenge others. The phone will show you a map to help you stay away from the wrong path, but make sure you don't spend too long looking at it, or you may run into a tree. PocketJourney - This is a good one for tourists, and once again allows you to get all interactive. Geo-activated points will spring little tidbits of information for you to look at and learn about your surroundings, and users can add their own knowledge to the mix in order to get the full 'local' experience. LifeAware - This one is especially great for those who often lose their mates (though if it keeps happening, maybe you should take a hint). It allows Android users to get updates on when their friends are in close proximity, and also lets you set specific areas that will let you know when people enter. It may sound creepy, but if you're out shopping and keep missing your mate, this can be a godsend (of course, you could just phone... but hey, that's SO 20th Century). Google Maps - An oldie, but a goodie. And this one's not just your bog-standard Google Map app that we all know and love... no, this one packs Streetview. Think about it, you can view almost any major city in the world, as you might if you were there, while idly stroking your handset! And not only that, it's integrated right into the phone, so you can fire it up right out of the box, which is handy if you buy the handset somewhere strange.